AFL Football Round 21 saw upset wins and losses . Essendon , vying for a spot in the eight to play Finals Footy ,were thrashed by Carlton . Collingwood were defeated by NMFC .Geelong beat StKilda , despite a third quarter surge by the Saints . 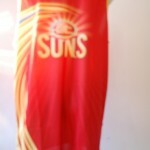 Brisbane Lions beat the Adelaide Crows at the Gabba . Round 22 saw even more upsets , when the Bombers were thrashed by the Tigers , and the Suns annihilated the Blues . Collingwood were defeated by the Eagles and the Hawks took top spot , by defeating the Swans . NMFC were beaten by Freo in a fight for eighth spot . Wouldn't be the end of the AFL Season without rumours of a coach sacking . Carlton Coach , Brett Ratten , is the current favourite after the Blues failed to make the Finals. 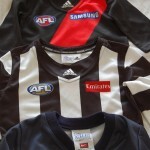 Fans will get along to the last matchs of season 2012 this weekend , wearing their football jumpers , jerseys , guernseys . This entry was posted on Wednesday, August 29th, 2012 at 12:14 pm	and is filed under AFL, football jumpers, NRL. You can follow any responses to this entry through the RSS 2.0 feed. Both comments and pings are currently closed.